Another month has rolled around and we’re proud to present a very strong slate of gifted writers and artists in our February issue. Nothing makes us happier than to highlight the best and the brightest from the virtual worlds, and that’s just who we have to offer in this month’s issue. 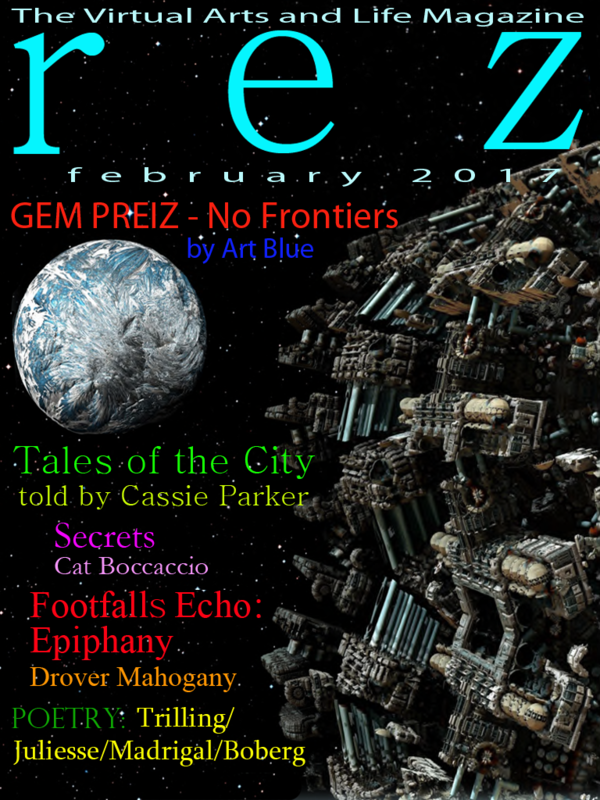 Starting with our cover story about Gem Preiz’s outstanding exhibit, No Frontiers (now showing at LEA16), our very own Art Blue guides us through Gem’s 16 “salles” (Gem resides in everyone’s favorite city, Paris), each one with an exquisite, monumental work like nothing else you’ve ever seen before. We’re also fortunate to incorporate an insightful interview with the artist, as well as several shots of his stunning work. Our poetry editors, Julllianna Juliesse and Mariner Trilling, are now betrothed and one of our favorite contributors, Merope Madrigal, commemorates this blessed event in her romantic ode, This is How. Something very exciting is coming together on LEA10, where Cassie Parker and Chrissy Rhiano are reimagining Victorian London (specifically the Whitechapel area, the scene of Jack the Ripper’s murderous rampage). In Tales of the City, Cassie takes us behind the scenes every step of the way as she and Chrissy scurry from the first kernel of an idea about Penny Dreadfuls, to an empty sim, to a finished London, replete with period shops and a live performance theater. When it opens, take a friend - - the streets may not be completely safe! Mariner Trilling’s Safe in the Arms of Yahweh demonstrates his peculiar gift of blending the sacred and the profane, and we know you’ll enjoy this irreverent bit of mischief. Jullianna Juliesse takes to the streets and reminds us that democracy is safe so long as We, the People, remain vigilant and raise our voices when necessary. Her poem, Day One, implores each of us to actively participate in our own futures. Also, Cat Boccaccio has a secret that she’s not telling, in her micro-fiction gem, Secrets. We love how Cat is able to capture in so few words an entire lifetime of meaning. Meanwhile, Drover Mahogany wanders through the hills of Australia, and by no means aimlessly. In fact, if he’s lost at all, he’s lost in his own thoughts, richly recalling past epiphanies in Footfalls Echo: Epiphany, his fourth in a series of musings about life. If you only have a moment left, spend it reading Tamera Boberg’s evocative Spring Morning After Berry would be our suggestion. 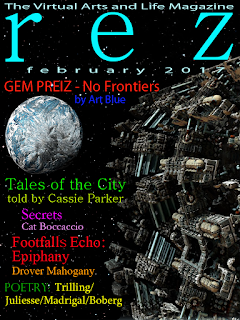 This is Tamera’s first piece to appear in rez, and you’re about to find out why we hope there will be many more in coming issues. Put another log on the fire, curl up, and enjoy this month’s issue.